Is Wheat Bad for You? Here are 11 Reasons for You to Be Wheat Free. 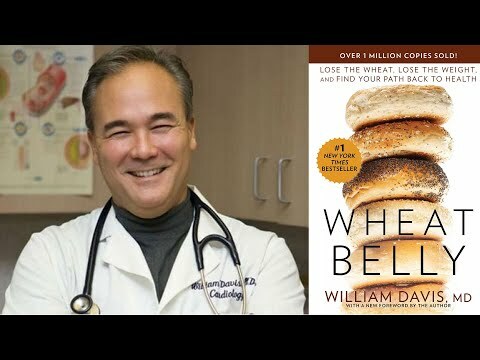 Why Gluten is bad for your health with Dr. William Davis, author of Wheat Belly"
I never thought of asking the question ‘is wheat bad for you?'. My guess is that you might not ever think of that as well. Asking if wheat is bad for you is like asking if cars are bad for you. Granted that there are accidents, but without cars, the country would come to a grinding halt. Without wheat, wouldn't the same happen? Look at most of the food products that are in a grocery, from bread to pasta to crackers to flour within products, wheat is everywhere! In my experience, wheat is not just bad, it is deadly! In just one day off of wheat, one day of life wheat free is like a new day on earth. Wheat free affects everything from depression to my weight, from anxiety to complexion, from being negative to feeling optimistic, from living with heartburn to none, and anyone who deals with heartburn knows what a relief that is, to have none! Recently I chalked it off to just my own natural predisposition, somehow genetically, I just cannot tolerate wheat, but why would anyone else speak much about it. So, to my pleasant surprise, I found a few experts who promote a wheat free diet to prevent the diseases they believe are attributed to wheat. This is purely all my opinion. I am not a nutritionist nor a doctor. I am a long time sufferer of depression, obesity and anxiety. In only six months I went from 250lbs to 175lbs, from a 48″ waist to a 32″ waist. I also experienced some relief from depression and anxiety. It is possible that what I did does not prove that wheat is bad for you. It could be because I went on what I call a High Vegetable diet! When I stopped eating wheat, I had to eat something in its place, and since I did not savor the idea of eating lamb chops all day, my method was to eat vegetables wherever I would normally eat bread. So, if in the morning I had an egg sandwich on whole wheat bread or whole wheat bagel, instead of the bread, I loaded up on vegetables and made an egg omelet with tons of vegetables, onion, garlic, broccoli, spinach, mushrooms and red pepper, in olive oil! In only one day, my heartburn was gone! How often did I suffer from heartburn? So can I say that I know for a fact that it was the wheat that was bad for me, or was it the lack of vegetables? The reason I believe it is the wheat is many times, I had sandwiches with tons of vegetables and still got heartburn. I just did not want to stop eating bread no matter what. I kicked and screamed that I must have bread, even three times a day, at least once, I needed my bread fix to feel full. Only when I quit the wheat did I get relief from heartburn. For years, I lived with heartburn and rolaids to get relief. I had no idea how dangerous heartburn is for the esophagus. I can only hope that I have stopped having the heartburn in time from eating away from the healthy cells. Every day, within an hour or so of my wheat meal, boom, my insides were on fire. So much so that not only do you lose your wish for living, you even lose the desire for moving! I just wanted to stay put and not go anywhere. Forget about exercise, I did not even want to go for a walk. So, on the heartburn front, I say that if you have heartburn, consider dropping wheat for a month and see what happens. Is it worth eating wheat? Do I love the thought of fresh-baked warm bread, oh yes, but the thought of fiery heartburn is even worse and I prefer to avoid the pain and drop the bread. How can wheat be bad for you when even in ancient times, people spoke of eating bread in the morning and man does not live by bread alone? As you will see in additional data below, there are people who say that if we ate the wheat of our ancestors, we would not suffer the diseases of wheat as we do today. The wheat produced today is hybridized and our genetics have no way of dealing with it, other than to protest by having our bodies react in negative ways. How many diets have you tried out? Have you ever experienced getting bloated? Especially after high processed meals that contain bread, pasta, pizza, flour products? changed after a good six months. 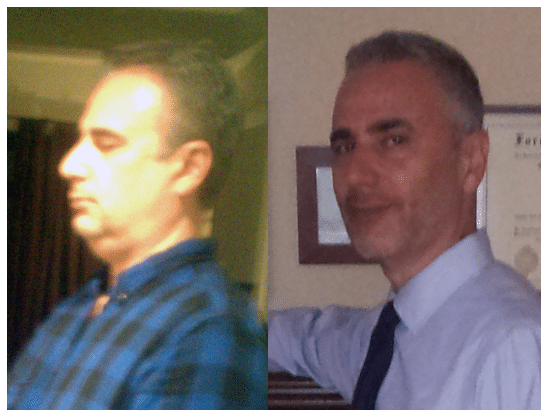 From blown up cheeks and double chin to much leaner without hours of exercise. Just look at this before and after face picture. In the before picture, about one year earlier, my hair is dyed, even my nose is bloated, pretty clear double chin, no structure at all to my face. In the after picture, I am about a year older, but to me, besides feeling better, I have been told that I look younger, even without my hair dyed. Wheat or at least today's modern version of wheat is a disaster. Before wheat, I am like Jello. I was invisible, on the street, everywhere, meaning nobody had much interest in saying hello to me or even responding hello. Suddenly, after six months, I became visible, I became worthy of a hello. I went from Jello to Hello! So, in terms of bloating, being invisible, face turning to jello, wheat is not your friend. I have one word for that four letter word of Diet – Impossible! I had a closet full of diet books. I had been on a diet since I was a baby, starting off with weight watchers pizza. I tried every other possible variation of diet in between, from fruitarian to Vegan to Macrobiotic. Nothing helped, the heartburn, the bloating, the discomfort and the weight just kept going up and up like a balloon. Why is it that when I stopped eating wheat, the weight started to melt off almost effortlessly? You think that I do not know the frustration of being forever fat? I know it, I have lived it. My theory is that we all have different physiology and just because you see slim people wolfing down pizza and staying slim, that does not mean that you can do the same! For whatever reason, your body just might not be able to tolerate wheat in any of its forms. Try it out for one month. Count day one and keep going. Tell me what happens after you have gone for 30 days without wheat. That means no bread, no pasta and no grains , period. Just make sure that you are eating vegetables. It is possible that you are just one of the people for who wheat is toxic. Wheat keeps your body inflamed and fat for as long as you keep eating it. If you have tried to lose weight for too many years, wheat may be your problem. Some people think about losing weight all the time. Ideally, I think we all know that we want to lose fat. Since eliminating wheat, I see more muscle now than when I was in my twenties. Before going on antidepressants, you should try going off of wheat. It is easier to manage depression effectively when you are feeling better physically. 6. Wheat and Fashion, Wearing Clothes that FIT! Tired of walking around in big sweaters? Are you tired of walking around in oversized shirts? Like the one I am wearing, the checkered one in the before photo. That is pretty much all I wore for a long time because it was large enough to cover the big bulging belly that I was hiding. Do you want to walk into a clothing store and buy an item off of the rack and wear it in comfort? No struggle to lose weight, no struggle to get on your pants, no struggle to fit in your clothes and feel like a person. No question that wheat is bad for you if you want to fit in your clothes. You often hear vague claims in the news that “sugar is bad for you” or that “wheat and gluten are bad for you”, but do you truly understand what these foods do to your insides? Most people DON'T understand the reasons… and the fact is that some of the foods I listed in the article title above can not only DESTROY your hormones and metabolism, but can also CAUSE you to get heart disease, type 2 diabetes, Alzheimers, and even cancer. We'll also show you exactly what you need to understand to eat in a way that BOOSTS your metabolism, balances hormones, PREVENTS heart attacks, STOPS cancer from forming in your body, and assures that you NEVER get type 2 diabetes, regardless of your “bad genetics”. Before I tell you why wheat can actually speed up the aging process in your body, let's clarify some simple biochemistry in your body. This deals with “glycation” in your body, and substances called Advanced Glycation End Products (AGEs). These nasty little compounds called AGEs speed up the aging process in your body including damage over time to your organs, your joints, and of course, wrinkled skin. But this age-increasing effect is NOT just limited to diabetics. Here is a little-known fact that's often covered up by the massive marketing campaigns by giant food companies that want you to believe that “whole wheat” is healthy for you. Wheat contains a very unusual type of carbohydrate (not found in other foods) called Amylopectin-A. Amylopectin-A has been found in some tests to spike your blood sugar HIGHER than even pure table sugar. Amylopectin-A (from wheat) raises your blood sugar MORE than almost any other carbohydrate source on earth based on blood sugar response testing that's documented in studies. This means that wheat-based foods such as breads, bagels, cereals, muffins, and other baked goods often cause MUCH higher blood sugar levels than most other carbohydrate sources. I ran personal blood sugar tests on myself using a blood glucometer about 45 minutes after eating 2 slices of wheat bread vs eating a bowl of oatmeal, with equivalent grams of carbohydrates. As you know now, the higher your average blood sugar levels are over time, the more AGEs are formed inside your body, which makes you age FASTER. The whole wheat spiked blood sugar MUCH higher than the oatmeal. 155 is a massive blood sugar reading that will certainly contribute to faster aging if you eat wheat frequently. In most people's diet, we eat wheat without even thinking about it at almost EVERY meal. The high blood sugar spikes caused by wheat also makes your body pump out more insulin which makes you pack on more body fat. These massive blood sugar spikes from eating wheat daily also cause damage over time to your blood sugar regulation system, harming your pancreas, causing insulin resistance, and eventually causing type 2 Diabetes. I think we have a strong case against eating so-called “healthy” wheat! The topic of gluten is on fire in the media lately. Most people are confused as to whether there's any real health risks with gluten for the average person that doesn't have Celiac disease. The truth is that even if you are not officially “gluten intolerant” or “gluten sensitive”, there are hundreds of published studies that indicate that gluten can cause inflammation in your digestive system. Gluten can even cause “permeability” in your gut, which can lead to a health condition that's on the rise lately called Leaky Gut, as well as other digestive issues and autoimmune problems. Another reason that wheat is terrible for you is that it contains what's called “anti-nutrients”, which are naturally occurring compounds in the wheat plant, but can cause undesirable effects in humans that eat too much of them. One of these anti-nutrients is called phytates, which blocks the absorption in your body of certain minerals like zinc, iron, manganese, and calcium if you eat wheat too often. Wheat has other mineral blockers and anti-nutrients aside from phytates, such as lectins. Lectins are another constituent of wheat that causes gut irritation. Yet another reason to minimize or eliminate wheat from your diet. There's absolutely nothing “essential” about wheat in the human diet. It simply does more harm than good…period. Stop Eating Wheat and Start to Heal from the inside out! Please comment with your thoughts on whether wheat is bad for you or not? Do you have any personal experiences with eliminating wheat from your diet?